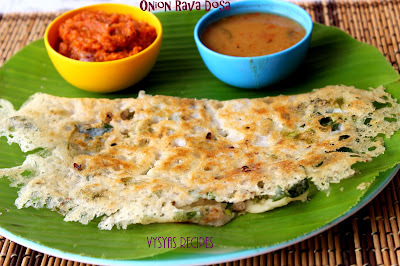 Onion Rava Dosa is an Popular South Indian breakfast Recipe.It is an Instant Dosa Recipe made with Rava,semolina,Rice flour & Maida.Spiced with cumin seeds,pepper corns & Green chillies.Topped with Roasted Onions.When ever we go for Restaurant, me & my husband often orders Onion Rava Dosa. Now we will learn the recipe, to make the dosa. Unroasted Rava/Sooji - 1 cup. Coriander leaves - handful . Chop the curry leaves,coriander leaves finely. Grate the Ginger & keep it aside. Mix well without any lumps. I used whisk to mix the batter. you can also use your hands. Then add cumin seeds,pepper corns,Green chillies,curry leaves, & coriander leaves. Now Mix well using a ladle. Give a standing time of 1/2 an hour. Meanwhile chop the Onions finely, then add oil in a pan/kadai, & saute the onions till it turns light Golden brown colour.Then keep it aside. Heat the tawa, when it is hot, smear little oil over the tawa, & rub with onions for 1 minute. Then take ladle of batter and pour it from the edges, then fill the center part,as shown in the picture.drizzle some oil. Then immediately sprinkle the onions. Cook in medium flame, till the dosa turns golden brown colour. It takes some time to cook. When it turns golden brown colour,don't flip the dosa. just fold the dosa & remove it from tawa. serve it with Coconut chutney,tomato chutney or sambar. 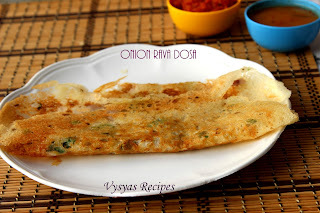 Make the batter thin like butter Milk consistency, to get crispy dosa. If you feel batter is so thin, add rice flour accordingly. If you feel batter is thick, adjust water according to consistency. Mix the batter everytime, when you pour the batter on the tawa/skillet,while making Rava dosa. Every time,when you pour dosa,check batter consistency, it may tend to thick, after few dosa's.Then adjust water accordingly. Adding Ginger & coriander leaves gives nice flavour to dosa. if you feel dosa is thick, dilute the batter with needed water to get lacy dosa's. Instead of oil, adding Ghee to make dosa gives nice taste to dosa. rava dosa looks so crispy and yum! 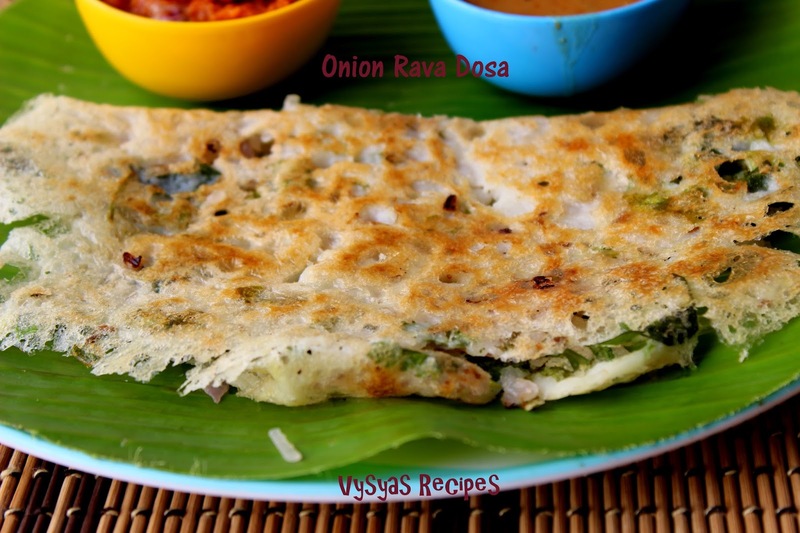 Nice to know your recipe for rawa dosa, I always enjoy this in the restaurant. Now i can try at home.